Just wanted you to know the Board of Greystone had many kind words to say about Timberline, yourself and Graham at the annual meeting last night. This was also echoed by the owners. Not a complaint in the house about what you all have done so far and the quality of service that you all providing. Adrienne P., St Louis, MOCommunity Association Manager, Rodemyer – Christel, Inc. The wall and landscaping turned out really nice. Two gentlemen that worked on the project were fantastic, so please extend my further thanks to them as well. Just got home. Looks awesome! Great crew of guys and thanks for getting it done ahead of schedule. I had a dinner party out on my new patio a couple of Sundays ago and everyone was complimenting the beautiful space! I am so happy I put the patio in! I have loved my time spent out there, whether it is puttering in the garden, drinking coffee and reading my book or entertaining. Thanks again! I couldn’t be happier with my now beautiful front and back yard. The staff at Timberline definitely far and exceeded my expectations. You and your team delivered the best customer service possible. They were extremely fast and efficient while still maintaining the best quality work possible. Timberline is definitely a trustworthy, reliable company one can depend upon. I will definitely recommend you if I hear of anyone wanting landscaping. Again, thank you for a job well done. The landscaping looks beautiful! We love it and have gotten a lot of compliments from the neighbors. Thanks so much for a job well done! I love my new patio, sidewalk and french drain. Thank you for your hard working employees. My neighbors were very impressed at their continued hard work and responsibility of being there every day the weather permitted. I would recommend your company and look forward to future projects! I LOVE my pond! It is exactly what I wanted the finished prject to be. Brian was able to take my wish list and turn it into what I had always dreamed of. 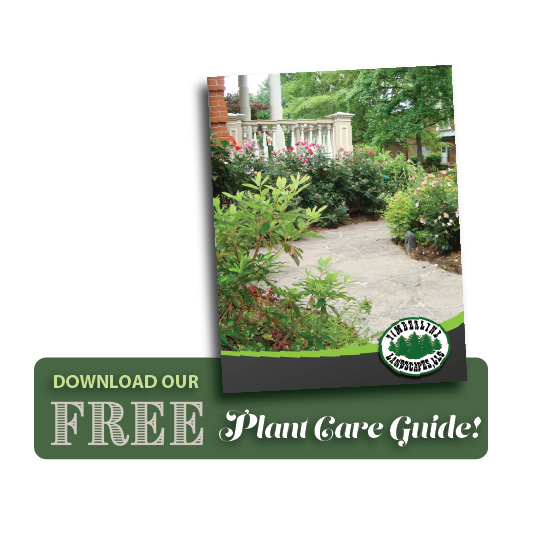 I continue to be impressed with the professional attitude and quality of work of Timberline Landscapes. I will be happy to recommend you to my friends. You all did a wonderful job, and I am totally happy. We are very happy with our backyard lighting job. We will definitely recommend you to others and use you again for another job. I enjoy looking out into our backyard every night! Just wanted to thank you for a more than professional job on what turned out to be a complicated project in replacing and redoing our outdoor landscaping. The employees were more than courteous and concerned with trying to do the best job possible on our 6 day project. My husband commented on the fact that they left the scene much neater than they found it; every evening before leaving this clean-up was done and it did indeed look better than they had found it originally! We were impressed with the level of professional customer service where you all tried to include the customer in on the project. Brian was helpful in suggestions on what would work in a particular location and also willing to adapt an idea we (wanted) incorporated into the design. We would be more than happy to recommend your company to anyone interested in good service and quality personnel to perform it. Thanks again for your great job and we look forward ot working with you all again on future projects. We love all the work you did for us, everything looks great! It will be nice to site out on the patio, enjoy the woods, and sip wine. Please extend my thanks to the men who worked on the challenging project. They’re amazing! We are very impressed with the quality of the design as well as, professionalism, and courtesy of the implementation team members. For a couple of life-long do-it-your-selfers, this project has been a very pleasant and rewarding experience. Kudos to the team at Timberline for transforming our overgrown yard! We were so pleased with all the steps along the way…the addition of landscape lighting has rendered the gardens beautiful both day and night. Thanks to all your staff for their professionalism. I am writing to express my utmost respect for the quality and service your company brings to the landscaping industry. As it relates to my business, you and your crews, especially your talented designers, have gone above and beyond my expectations. Being in the construction industry, I have no interest working with sub-par subcontractors, no do the clients that I serve. 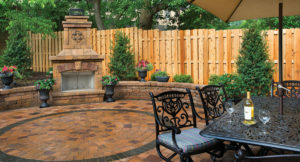 In high-end residential contracting there is no place for non-professional companies, that is why I will use Timberline Landscapes for every project that I am involved in. Thank you so much! We are so happy with our gorgeous lighting and beautiful landscaping! Your crew was delightful to work with! Timberline Landscape constructed a retaining wall and staircase for us in late summer. There isn’t enough paper and I don’t have enough time to express how pleased my wife and I are with their work. I’m not talking just about the quality of their work; it was perfect. I’m talking about the preliminary set-up, the after-job cleanup, and everything in between. There wasn’t the usual post-nuclear destructive look about our property that you get before contractors begin work Everything was neatly stacked and out of the way. One of the fellows even left a note on out door, apologizing for leaving the Bobcat in our turn-around partying space. Trash and materials were picked up daily, leaving no messes in the yard or on the driveway from one day to the next. And when they were finished, it was as though they’d never even been there, the area was so clean. The retaining wall is perfect. They did a marvelous job and it enhances the front of our house considerably. I simply can’t say enough about Brian and his crew at Timberline Landscapes, but if you’d like me to say more, please feel free to call me at my office (314-822-xxxx) or at home (636-677-xxxx). I’ll be happy to answer any question I can. I simply can’t recommend these guys highly enough. 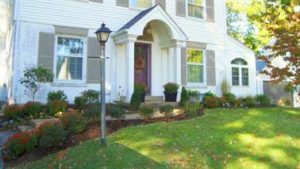 Timberline just finished landscaping our front yard last week, and we are very happy with the outcome. We were given detailed plans and were able to change some of the plants during the proposal period. Our project could be considered on the smaller side, but the crew took the time to address any concerns or questions that we had. 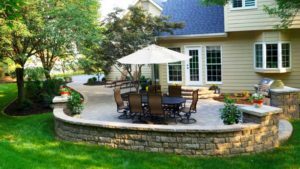 We had bushes, small trees, railroad ties and a concrete planter ripped out before Timberline installed a new curved stone wall and plants. We were told how to care for the plants and the crew did a good job with clean up. I was looking for someone that really knew what they were doing when it comes to landscaping. I was not just looking for someone with a strong back to throw block. I needed three distinct task completed for my back yard. I have a walk-in basement and a deck. The area under the deck was always wet. I needed my yard drainage fixed, a rotten railroad tie wall replaced with a block wall and either concrete poured or a paver patio installed. I interviewed 7 or 8 contractors. Timberline suggested ideas and entertained my ideas as well. They promptly got back with me with a Cad Design of what my yard would look like and a quote. We discussed a few changes and they made them and got started. They were professional from beginning to end. The finished product was awesome and something to be proud of. My only suggestion is to book them early because they get busy. I recommend them highly.